IBPS Clerk Syllabus 2019 for Preliminary & Mains Exam Pattern updated. Candidates who have applied for the IBPS Clerk 2019 Exam can download IBPS Clerk 2019 Syllabus PDF. You may also visit the official website www.ibps.in for latest IBPS Clerk 2019 Exam Pattern. I think you have started the preparation for IBPS Clerk 2019 Exam. That’s why you have searched for IBPS Syllabus of Clerk Preliminary Exam and reached this article. So, now you can refer Complete Institute of Banking Personnel Selection Clerk Exam Syllabus here. Also, download IBPS Clerk Mains Syllabus PDF without any cost. You are also advised to visit the Official Notification once to confirm that Official Syllabus and this is same. We are providing the IBPS Clerk 2019 Syllabus as mentioned in Official IBPS Clerk Notification 2019. Applied candidates are suggested to refer the Latest IBPS Clerk CRP 9 Syllabus 2019 along with New Exam Pattern. You can also get this IBPS 2019 Syllabus from the Official website www.ibps.in Since you have less time for the exam preparation, you don’t waste your time searching for IBPS Clerk Exam Syllabus 2019. Now, download IBPS Clerks Syllabi and Subject wise Topics list from the enclosed link and start your preparation to crack the Preliminary Clerk exam. Everything is possible with the perfect planning and schedule. So, make the best preparation plan from this minute. You have already here to check IBPS CRP Clerk Syllabus 2019. Therefore, download IBPS Clerk 2019 Syllabus Official PDF and also refer the Latest IBPS Clerk Exam Pattern 2019 here in this page. Also, visit the IBPS Official Website www.ibps.in for latest updates. 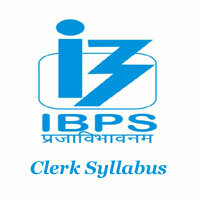 Along with the IBPS Clerk Syllabus, you can also get details about IBPS Clerk Exam Pattern here. Selection Process of IBPS Clerk 2019 consists of Preliminary, Main Exam, and Interview. So, you can check IBPS Clerk Prelims Exam Pattern 2019 initially. The IBPS CRP in Clerical Cadre Consists of Objective Type Multiple Choice questions from various subjects. There will be a 0.25 Negative Marking for every wrong answer. The total Duration of the IBPS Prelims Exam is One Hour. Candidates need to attempt 100 Questions in 60 Minutes. IBPS Prelims is a Objective type Multiple Choice Test. Numerical Ability & Reasoning ability consists of 35 Questions where the English Language contains only 30 Questions. Each and every question carries ONE Mark. The total Duration of the IBPS Office Assistant Mains Exam is 135 Minutes. Candidates need to attempt 200 Questions for the total of 200 Marks. IBPS Mains is a Objective type Multiple Choice Test. Each subject contains 40 Questions. The weightage for each question depend on the subject it belongs too. No of Vacancies: 19,243 Posts. Prelims Result Date: January 2020. Download Admit Card for Mains Exam: January 2020. Mains Exam Date: 19th January 2020. IBPS Clerk Prelims Syllabus updated in this section. So, you can refer the IBPS Clerk 2019 Syllabus of Preliminary Exam here. IBPS Syllabus for Numerical Ability, Reasoning & English is same for both Prelims and Mains Exam. But the difficulty level of the Prelims and Mains is different. The IBPS Clerk Mains Syllabus 2019 for remaining Subjects is given below. Well!!! Have you downloaded the Complete IBPS Syllabus and checked the Clerk Exam Pattern. Now, start your preparation by downloading the IBPS Clerk Previous Years Question Papers from the below link. These ibps.in Clerk Sample Papers will help the candidates for better preparation. i want past ten years question papers with solved answers. can u please snd me? Last year Rajasthan obc cut off kitni rahi thi ?